Earthquake Prediction: Yes, Remember The Planets Today! Yes, Remember The Planets Today! What is special today? What is causing the 'expected' excitement with 6.0 R and 5.6R events? All of them in the oceans? Mercury is station my friends, also NEPTUNE is lurking! Ok what is the story then? Today MERCURY is station prograde, (yes your comms will improve) a Mercury who has just been conjunct with Mars, very aggressive, trining with lightning Uranus AND,....with NEPTUNE perigee. Well its influence is magnified today. Lets look at the chart above. Mercury Uranus tune up with a lovely trine Mercury. Mercury, Mars and Uranus linked up! But Uranus is teasing annoyingly Neptune with a semisquare. At the same time his magnificence the Sun is opposite Neptune! 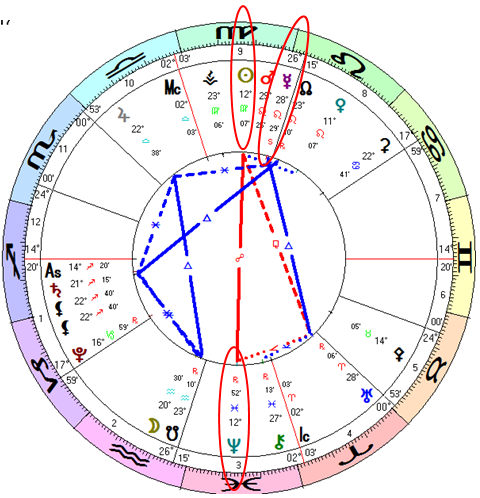 So, all things Mercurian we hope to improve soon, but today we bear the brunt of NEPTUNE arguing with Sun and the mopping up of Mercury's excessive headaches (meeting with Mars) which brought him ill and standstill today from the excess of yesterday.